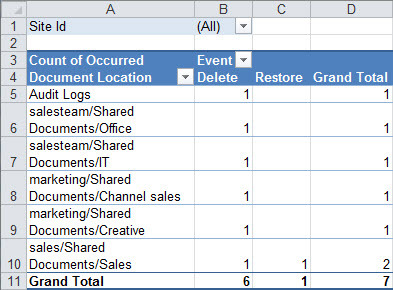 You can use the audit log reports provided with SharePoint to view the data in the audit logs for a site collection. You can sort, filter, and analyze this data to determine who has done what with sites, lists, libraries, content types, list items, and library files in the site collection. For example, you can determine who deleted which content. Knowing who is taking what action on which content in your site collection can be critical in helping your organization fulfill its requirements, such as meeting regulatory compliance and records management. You save an audit log report as a Microsoft Excel 2013 Preview workbook to a library in the site collection that you specify. Note: Pages, such as .aspx, aren't considered documents so they can't be audited in SharePoint Server 2016. Content viewing Reports users who have viewed content on a site. In SharePoint Online, this report will be blank as these events are not captured during auditing. On the Operation Completed Successfully page, click click here to view this report. If you get an error, it may be because audit logs weren't enabled or there was no data to show. See Configure audit settings for a site collection to be sure event logging is set up.